One of our budget friendly designs for a 4 bedroom house plans this design for a cost effective home is a great plan for anyone interested in a budget friendly beautiful home. The design of this house plan incorporates a spacious living room, dining and kitchen areas with outdoor utility areas. The beauty of this design is in the well balanced form with the picturesque pergola outside the living room terrace and in the back. With a total area of 149 square meters, this home offers a ground floor area of 84 m2 and an upper floor area of 65 m2. With overall plinth dimensions of 11m by 10.1meters, this design is best suited for a property of an eighth acre and above. Nice. Advice me on the cost of the plan. Thanks Joel. We have sent all the details to you via email. We await your response. Would you please advice me on the possible price of the house if it were to be build around the rural Western or Nyanza regions of Kenya. The standard cost of building currently is between KES 25,000 – KES 35,000 per square meter, according to the latest published rated from the Institute of Quantity Surveyors of Kenya, depending on finishes and location of the project. 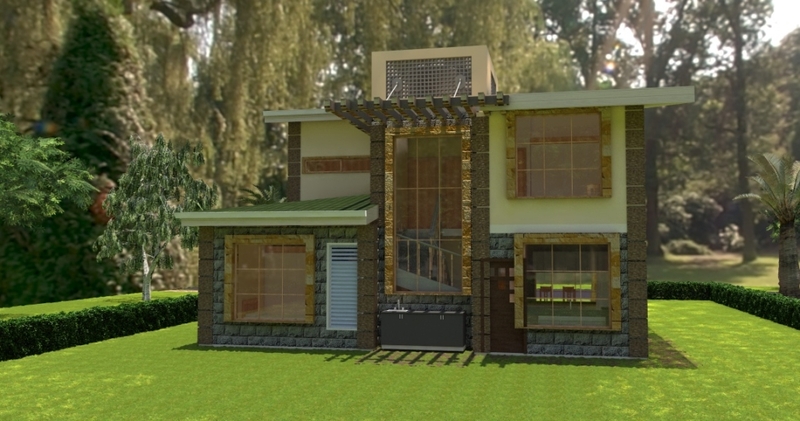 This particular house plan is 149M2 and using the rates given, the estimated cost of construction would therefore be between 4M-5.6M depending on the finishes used. Keep in mind that a lot of factors affect the cost of construction, including your location. I have sent you more details via email. Thanks for your inquiry. We have sent you an email. Kindly check your email. We have sent all the details. how much does the kenani mid plan cost and can one see the first floor plan. How much can the house cost to build? To have such a house with basic furnishes, how muchwould it cost me. Secondly, can it be build in phases…? Hi, What is the total cost of putting up such a house but with a normal roof and including a walk-in closet? Thank you for getting in touch David. Check you inbox for all the details. Hey David, what is the estimated cost of building this house? Hello David, the plans are very interesting, I understand they are ready made and I believe minimal customization can be done, to start with how much does the plan cost, and are cost breakdown for Nairobi and environs a part of the deal or how do we go about it all. Thank you for your inquiry. Please check your inbox for all the details. Iam interested in the above design,could I know how much I need to complete it. Hello David, what’s ost of this house plan construction, given I own the land. This house is about 150 square meters. Applying a simple rate of KES 30,000 per square meter, the cost would be approx. 4.5M for construction only. Check your inbox for all the other details you need to consider. Comment…Hi David, what do you mean by 4.5M for construction only? is it just the structure without finishing or are you talking about minus the land value but inclusive of everything else? This cost is for construction of the house from beginning to end. The other costs not include are the cost of professional services (Architectural, Engineering, Quantity Surveyor, Services Engineers) etc, cost of land and cost of getting approvals where required. Kindly check your email for all the details required and thank you for considering our services. I have resent the email from 2 different accounts. Kindly check your spam folder. Alternatively, kindly call us on 0721 411606, 0721 318614.
how much does it cost to build this house at juja on your way to juja farm? This particular plan is 149M2. Using the rate provided above, it would cost you KES.3.725M-5.215M. I hope that gives you a good guide to work with. More details in your inbox. I look forward to working with you and thank you for considering our services. Hi Arch David kindly could someone apply for internship in your office?Iam studying diploma in architecture…Technical University of Kenya. Thats for the response. i will contact you for a site visit first. i meant thanks for the response. This is a very nice design. I have seen the costs range from 3.75 – 5m without any finishings and professional fees. Would it be possible to make any adjustments to allow for a lower budget say about 4m with finishings? Looking forward to your response. That ranges covers construction including finishes. The only thing not included is professional services as well as county government fees. I have sent you more details via email. We can definitely make it work. What are the proffesional costs involved and county fees in Syokimau area.It should fall under mavoko i think. I would estimate the cost of approvals by Movoka around 70,000, assuming all your documents are in order with no need to make any changes. I have sent you more details via email. Hi David, what is the total cost of building double houses sharing a wall with this plan in kiambu? The standard cost of building currently is between KES 25,000 – KES 35,000 per square meter, according to the latest published rated from the Institute of Quantity Surveyors of Kenya, depending on finishes and location of the project. So basically, it will simply depend on the size of the house. A 3-4 bedroom house can range in size. Take an example of a 120m2 house; the cost will range between 3M-4.2M. I hope these figures give you an idea on the cost of construction. How much would this house cost to build and with walk-in closet in master bedroom? The standard cost of building currently is between KES 25,000 – KES 35,000 per square meter, according to the latest published rated from the Institute of Quantity Surveyors of Kenya, depending on finishes and location of the project. 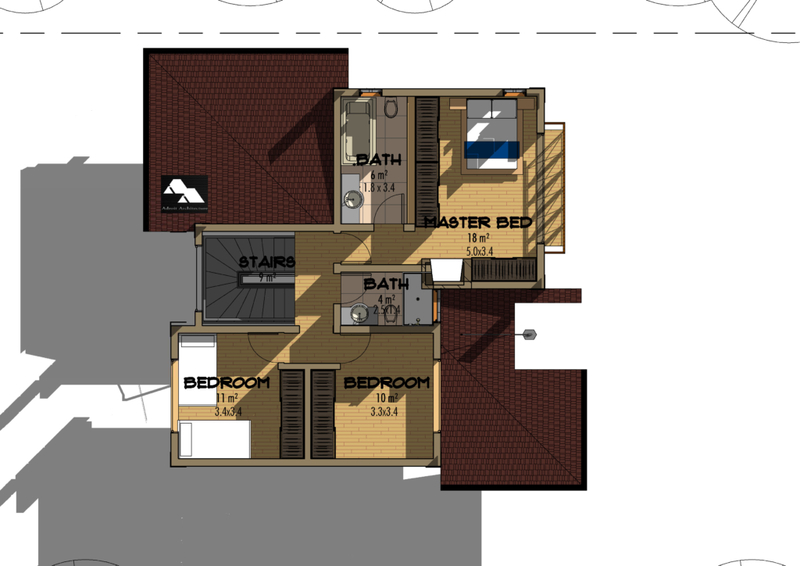 A 3 Bedroom House Plan can be around 120m2. Using the rate above, a house of that size would cost between 3M-4.2M, that would cater for your walk-in closet in the master bedroom. Can this plan sit comfortably on a plot of 14.6M by 21M?? What kind of foundation is appropriate for it in an area with 2feet deep cotton soil and bedrock underneath. Now, the plinth area of this house plan is 11m by 10.1meters, this design is best suited for a property of an eighth acre and above. This means that the design with perfectly fit in a piece of land 14.6M by 21M, leaving a decent amount of space all around the house. On the issue of foundation and the black cotton soil, what needs to happen is the 2 feet of black cotton soil needs to be scooped out completely until you hit the bedrock. After that, the foundation can be ask as normal. I was told you cannot get NCC approvals with Letters of Allotment. Is this true? If not what would you advice me to do? Indeed you can get a four bedroom house plan. We have many listed on our site and we can custom design a plan for you. Usually, a contractor is charged with the mandate of building the house and thus managing the construction. We come it by offering supervision and guidance to the contractor through periodic visit to the site as well as continuous communication with the entire team involved over the cause of the construction. A letter of allotment is acceptable as long as it is validly issued and all supporting documents are presented. Kindly avail me with the details for this biulding . I am from Uganda. I sent you an email with all details. I await your response. how would i get other similar plans of a 4-bed-roomed house 1 storey? Would the cost be different say in NAKURU? Is it possible to build it in phases? I would like to compare/contrast at least four options similar to the one above. When it comes to construction cost, location does bring some variances based on availability and cost of raw materials, the right people to work with etc. The rate given by the Institute of Quantity Surveyors of Kenya is KES 25,000-35,000 per square meter. This rate differs based on location and many other factors. Please check your email for more information on the questions you have asked. in connection with the email above do you have an office and/or representative in Nakuru that we could link up and discuss a little bit more in detail? I’d like to know how much this would cost to build. The land is available. The standard cost of building currently is between KES 25,000 – KES 35,000 per square meter, according to the latest published rated from the Institute of Quantity Surveyors of Kenya, depending on finishes and location of the project. This particular house plan is 149M2 so for the two, you can estimate a cost of between 3.725M-5.215M depending on the finishes. You can also bring down costs with proper sourcing and utilization of materials, how to engage you contractor and so on. I have sent you more details via email. Thank you for your inquiry! Hi David. I’m truly impressed by your ingenious designs…i’m your client from now. 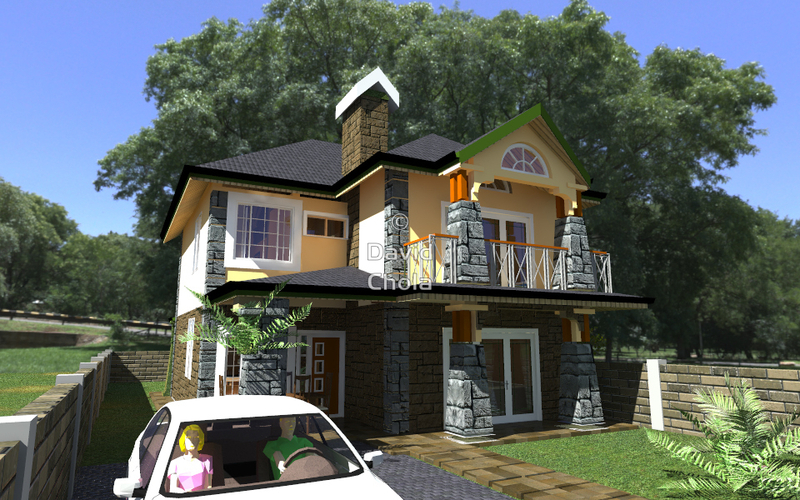 My interest is on the 4 Bedroom Juja-Edge House Plan. What is your estimated cost for such plan including all necesary approvals needed (Ruiru sub county,Kiambu). I’d be interested to make slight adjustments in the plan inorder to fit my purpose. How can we go about it? If i was to get a contractor, are you a consortium providing design & constructions? or you can provide links to good & fairly priced contractors. Kindly let’s share more via email so as to get the work going soonest possible. Kindly check your email for all the details. Can’t wait to hear from you. I am among the converted! I would like to know your preferred contractor, who can do exactly your design. 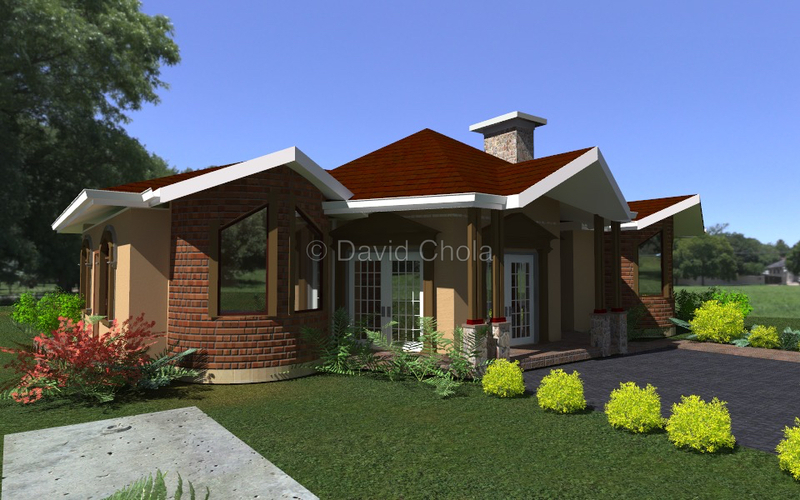 Total cost of this design, construction cost and approvals for Mavoko sub county – Machakos . In other words what will this house cost me today with the standard finishing?? I just want to go and settle in this magnificent piece of architecture! Thank you for the glowing compliment. It is our goal to produce designs for that meet the needs of the client functionally and aesthetically. 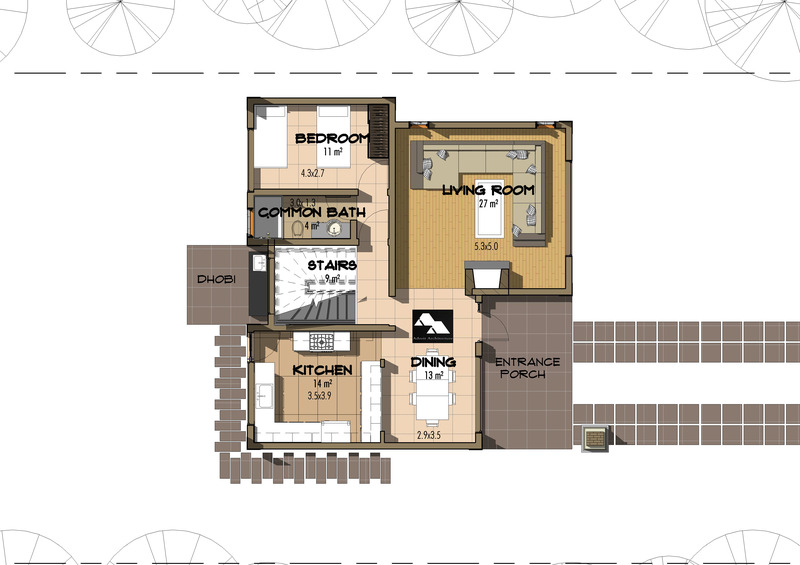 I have sent you more details via email on this house plan. The house looks awesome, kindly share approximate cost of coming up with the shell first i.e minus finishes. The standard cost of building currently is between KES 25,000 – KES 35,000 per square meter, according to the latest published rated from the Institute of Quantity Surveyors of Kenya, depending on finishes and location of the project. This particular house plan is 149M2 so for the two, you can estimate a cost of between 3.725M-5.215M depending on the finishes. Of course there are many other factors that affect the final cost of a construction project but this is a good guiding factor to work with. To construct the shell of the house without finishes, that would take about 60%-70% of the total construction budget. So with these figures in mind, you can calculate and have a good idea how much you need to put up the shell and how much you need for the finishes. Your architecture is great. Would you recommend the use of prefabricated panels for the 4 bedroom A plan house? And how much would it cost roughly? Our experience shows that most manufacturer of prefabricated panels prefer very simple house plans and tend to prefer their own designs, which they have already used to come up with the panels. That said, the best way is for the design to be submitted to a panels manufacturer who will then give a quote for construction using panels. The one we have worked with have trained contractors who handle the construction. You have great work.The 4 bedroom house looks awesome. …can you please give the details of constructing one arnd Mtito Andei area in makueni county..inclusive the finishes. .
Hi. I like the design. How much for the plan? I have sent you all the details on this plan. Give a breakdown on the cost kindly. 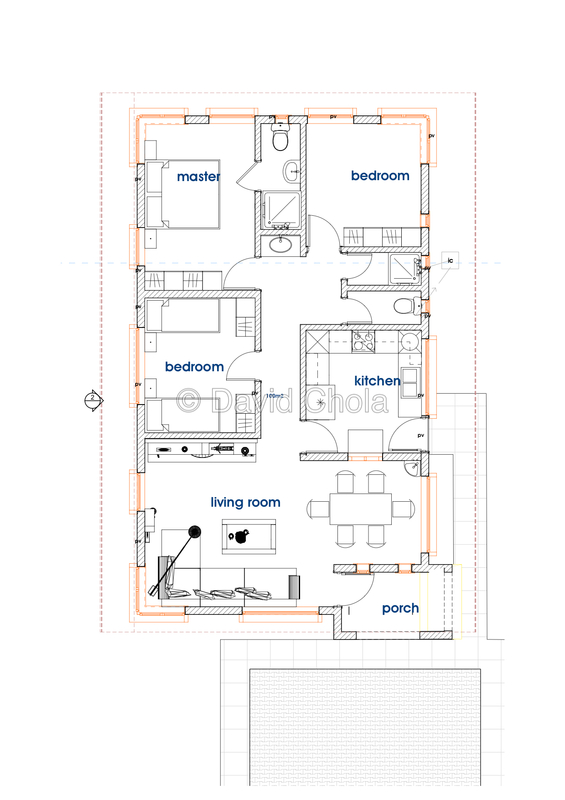 You need to give yourself about 4-6 months for this house plan. As for workers, that will totally depend on the builder/contractor that you choose to work with. I need a simple 4 BR mansionett on a 1/4 an acre piece of land in Kiserian. How much shall a plan cost? And a rough estimate in the cost of construction? Please check your email for all the details. I await your response. Excellent Orkney on the designs. I am interested in a four bedroom flat roof maisonette. I like the design above probably with a few modifications. Kindly share more details. Check your email for all the details Martin. Yes indeed we can make modifications to the plan as you desire. Get in touch and we can take it from there and thanks for getting in touch. Can I have the cost of this project please? The standard cost of building currently is between KES 25,000 – KES 35,000 per square meter, according to the latest published rated from the Institute of Quantity Surveyors of Kenya, depending on finishes and location of the project. This particular house plan is 149M2 so for the plan, you can estimate a cost of between 3.725M-5.215M depending on the finishes. Keep in mind that a lot of factors affect the cost of construction. Thanks for the great work.Can the house fit in a 30*60 plot and how much will it cost me? The plan as it is has a plinth area of 36*33 feet. So for your property of 30*60 feet we will need to do some modification to the plan for it to fit but there will be no room left around the house. Take a look at these different 4 bedroom house plans on our site. The standard cost of building currently is between KES 25,000 – KES 35,000 per square meter, according to the latest published rated from the Institute of Quantity Surveyors of Kenya, depending on finishes and location of the project. If you construct a home of say 120m2, using the rates provided you can budget between 3M-4.2M. This are estimate figures that you can work with. I need a such 5 BR maisonette on a 50*100 piece of land in Kiambu. How much shall a plan cost? And a rough estimate in the cost of construction? Please check your email for all the details on 5 Bedroom House Plans. Hellow how much would this cost me? 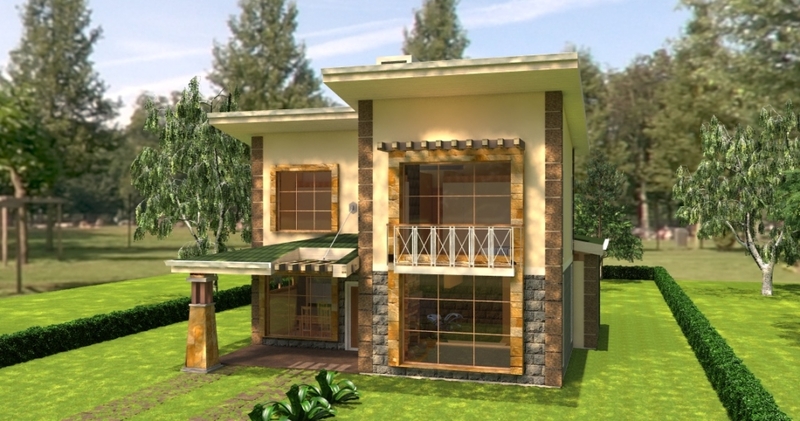 Good evening.great designs.can the four bedroom fit well in a 30*60 plot?and what would be the budget? 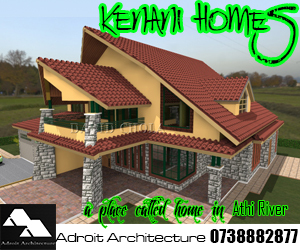 This house plan has a plinth dimension of 11M by 10.1M (33*31). For your property of 30*60 we will need a slight adjustment to narrow it. You will have no space on the side but lots of space front and back. I need a such 4 BR maisonette on a 50*100 piece of land in Kisumu. How much shall a plan cost? And a rough estimate in the cost of construction? The standard cost of building currently is between KES 25,000 – KES 35,000 per square meter, according to the latest published rated from the Institute of Quantity Surveyors of Kenya, depending on finishes and location of the project. 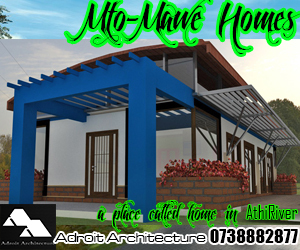 Here is a list of 4 bedroom maisonettes listed on our site. You can visit each link for more information. I have given an approximate cost of construction based on the rates above. 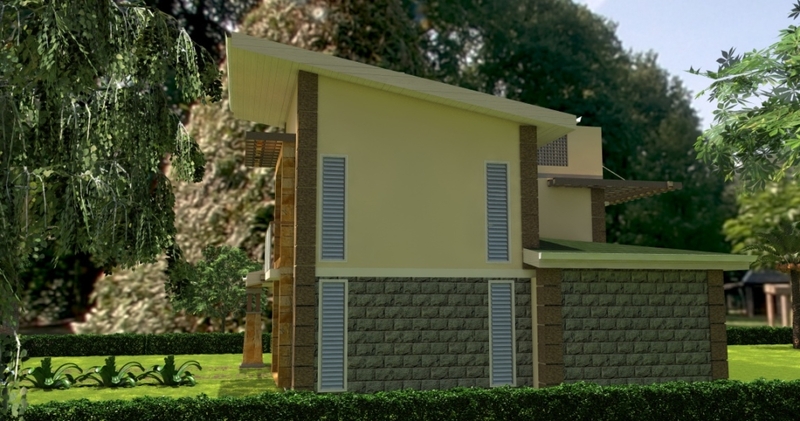 Kindly furnish me with the total completion cost of 4 bedroom at Kajiado ngong. The standard cost of building currently is between KES 25,000 – KES 35,000 per square meter, according to the latest published rated from the Institute of Quantity Surveyors of Kenya, depending on finishes and location of the project. This is a comprehensive rate given that covers all aspects of the construction project including sewerage, drainage, septic tank, perimeter wall, electricity (getting connected to the national grid, and VAT charged for all services and products. Where you will not need any of the said services then you will make a saving on that aspect. If you were to build a 2 bedroom apartment of say 70M2 using a rate of 20,000 per square meter, your budget would be about 1.75-2.45M. Hi David ochola,kindly advice on cost estimates of a four bedroom house master ensuite with walk in closet. The standard cost of building currently is between KES 25,000 – KES 35,000 per square meter, according to the latest published rated from the Institute of Quantity Surveyors of Kenya, depending on finishes and location of the project. 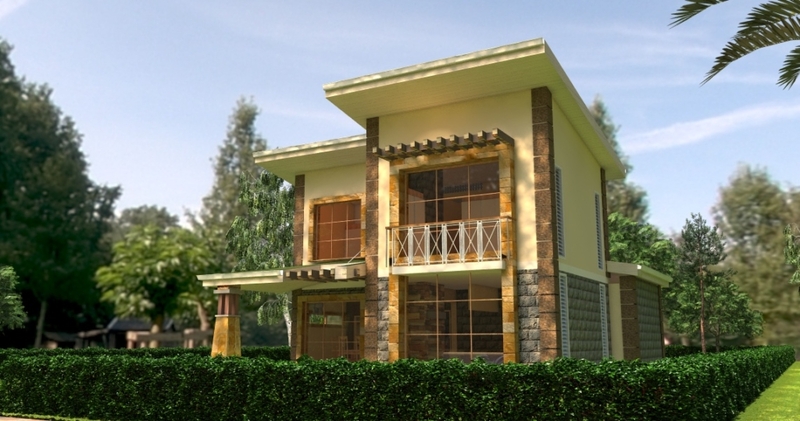 For a four bedroom house plan of say 150M2 , Approximate construction cost is 3.75M-5.25M. I have emailed you all other details. I really admire your designs. What I want to know do you build? Again are there homes being on sale around i would want to be in a home designed by you! I love all your designs. Thank you for your good work. I will make sure I will give you more work soon. Thank you for your kind comment. We can definitely help you with our construction project whenever you are ready. Hallo.id like to know how much that house would cost today in 2018.and do you help in building? Hi David, The above is impressive.Is it possible to get a cost breakdown for someone who wants to build in phases to reduce the financial pressure. How much can a 4 bedroom bangalow cost on a 50*100 plot? One master bedroom has a walk in closet. Do you have a sketch plan for that? 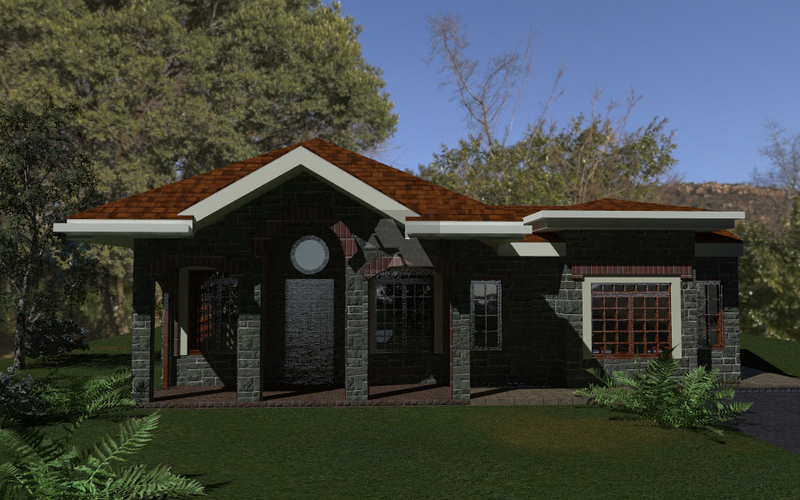 Take a look at this version which has a standard pitched roof. I have sent you more details via email. Thanks for getting in touch. How much would it cost to do this house? and how are your rates; as is and with adjustments? Hi David, good work you are doing. I’m planning to build a 3 bedroom master ensuit maisonette in Chokaa. How far can 2M take me? Check your inbox for my email. Hey David- Just checking house designs. This one looks good. Let me have more details on it, prospective construction site is Kiambu area. Check your inbox. I have sent you all the details on this house plan. Am interested on this plan,Please mail me the plan and construction cost. I have sent you all the details via email. I await your response. I hope you have received my email with all the details. Awaiting your response and thanks for getting in touch. hello. I need photos of latest designs of a standard 4 bedroom masionates (both all en-suit and master en-suit )and their estimated cost please. Would there be a difference in cost if one decided to do a flat roof,sort of slab, instead of the conventional roofing (mabati/tiles)? It depends on a few factors. For a conventional roof, if it is very highly pitched it will be costly to put up but the best part is it require a lot less maintenance. For a flat roof, you have to deal with the cost of the slab as well as water proofing which must be done very well to do away with any leakages. Flat roofs are also high maintenance. From experience, a slightly pitched roof may be cheaper than a flat roof in the long run. There are also other factors to consider like your preference, space requirement etc. If I want to adopt the 4 Bedroom Juja-Edge House Plan (May be with slight modifications) how much will you charge me? How much will you charge for the professional fee, architectural fee?for the same plan? The same design? We can definitely make the necessary adjustments to add a walk-in closet. That would add about 10M2 to the total space of the house without any other adjustments. We can make the necessary adjustment to add a walk-in closet to the house plan. That should increase the overall space by about 10M2 without any other adjustments. Kindly check your email for more details and thanks for getting in touch. I hope you got my email. Thanks for getting in touch. Hi, kindly let me have latest designs for 4 bds mansion. Also need to know the cost of drawings, approvals & etc. I hope you received my email with all the details. Let me know if you have any further queries. The standard cost of building currently is between KES 25,000 – KES 35,000 per square meter, according to the latest published rated from the Institute of Quantity Surveyors of Kenya, depending on finishes and location of the project. 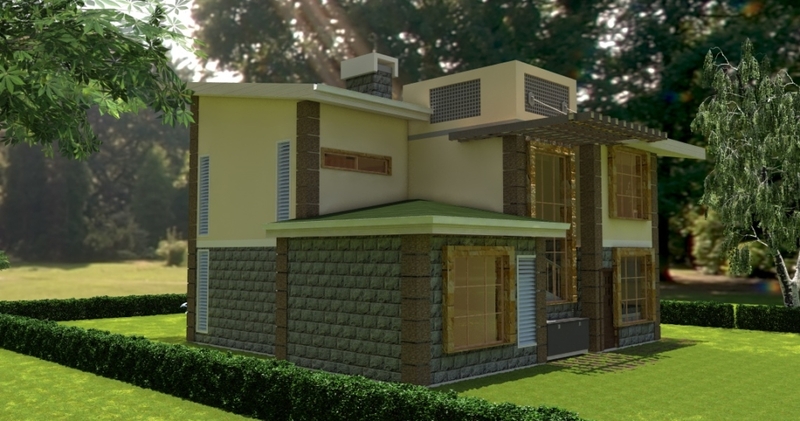 This particular house plan is 149M2 and using the rates given, the estimated cost of construction would therefore be between 4M-5.6M depending on the finishes used. Modifications are done at no additional cost. This is a great piece of work. How do I get it. Hi, kindly let me have latest designs for 4 bedrooms maisonette and the cost of drawings, approvals etc. Here are some plans you can look at. Visit us if you can, we have many other plans that we can discuss. Check your email with all the details. I would certainly wish to have one like this with minor adjustments e.g. garage. How do I reach to you directly? Here are our contact details and office location. Please check your email. Awaiting your response. 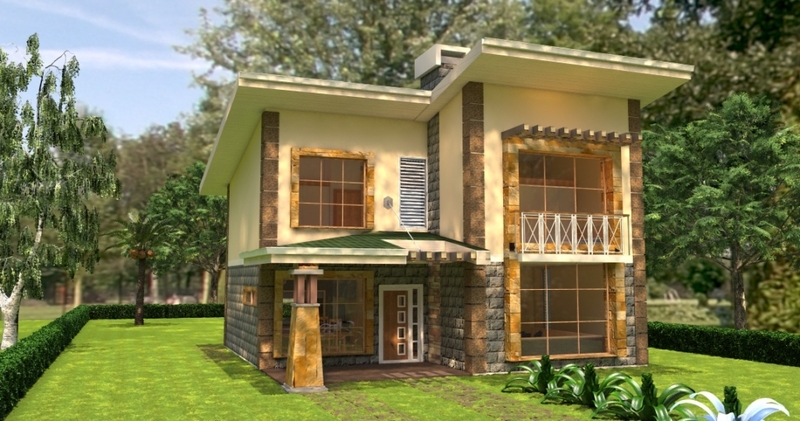 How much would this lovely Juja house cost to construct? The standard cost of building currently is between KES 25,000 – KES 35,000 per square meter, according to the latest published rated from the Institute of Quantity Surveyors of Kenya, depending on finishes and location of the project. 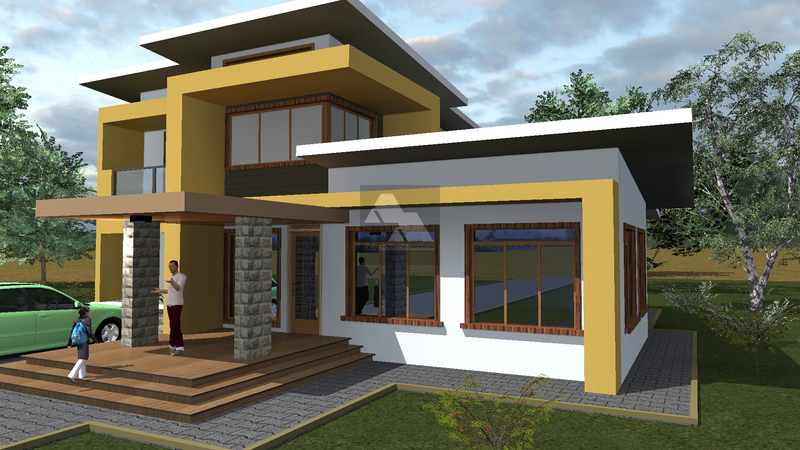 This particular house plan is 149M2 and using the rates given, the estimated cost of construction would therefore be between 4M-5.6M depending on the finishes used. Keep in mind that a lot of factors affect the cost of construction and that this is a pretty comprehensive rate. More details sent via emial. Do you have any commercial buildings plans? How much would this house cost? I have sent you a details email on your inquiries. We can discuss further when your respond on email. a potion in future use. kindly respond with advise. good works keep it up . Build your house in phases. This is the most recommended option. Your budget can allow you to build your structure and a few finishes, taking the house to a place where it can be occupied. With time, as more funds become available, you can continue working on finishes, e.g. tiling, cabinets, painting/wall finishes and so on. I really like your designs. I am planning to build I 6 bedroom bungalow that covers 5000sq feet. All bedrooms ensuit with a large kitchen, store, living room, dining room and two porches at back and front plus one car garage. Kindly advise on how much it will cost. I am very interested especially in the roof as I plan to use bricktile profile roofing material. Please advise me roughly how many may be required and generally the cost of building. How much will you charge me for plan. It would be our great pleasure to design for you a house with all the specifications you have described on your comment. I have emailed you. Get in touch. We can meet and agree on the way forward. I have a house plan of my choice would you look at it and advice me? I hope you got my email with all the details on how to get a house plan from us. We have noted from your comments some of the features you want in your house. 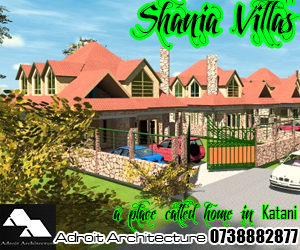 We ensure that the all our house plans fit into the needs and budget of our clients. Kindly respond for further discussions. I haven’t received the cost of the plan Sir. Am kindly requesting for the Kenani. Kindly send incluisively with the estimated cost. Or rather how can I see you sir for planning and modification of the same? You can call me on 0721 318614. Sending you an email right away. Yes the plan can fit into a 40*65 piece of land.